We can also offer car rental from our office in Fuengirola. If you wish to hire a car from Marbella or Nerja the nearest office is from the Malaga Airport Head Office which is open 24 hours a day, seven days a week. Our car hire service offers excellent rental rates, special discounted rates for home owners, early booking discount, and a fuel refund policy, meaning that you only pay for the fuel you use during your car rental period. Helle Hollis provides top quality car hire and you will find no hidden extras with your car rental. You can make your Malaga airport car hire reservations online and have the option to cancel these at no extra cost if the need arises. Have a look at our customer reviews from our happy customers who have hired a car in Malaga from us and feel assured that car rental with Helle Hollis gives you a stress-free start on your holidays. Feel free to contact either our head office at Malaga Airport or our Fuengirola office for more information about each of our car hire offices on the Costa del Sol in Spain. Voucher, promotion or charity code? Free Upgrade Offer Early Bird Offer Fair Fuel Policy Sign Up - Free! Why book your Malaga Car Rental with Helle Hollis? Helle Hollis has been providing car rental services on the Costa del Sol for 35 years and has a fleet of 1400 cars. Upon arrival to Malaga Airport, the free Helle Hollis courtesy bus service takes you to the Head Office in a short two-minute ride. You will avoid long waiting time and as Helle Hollis is open 24 hours, you can arrive and collect your hire car at any time, day or night. Helle Hollis is known for being a fair and transparent Malaga car rental company, where you will get a safe and worry-free start to your holidays. For more information about Malaga, please see our Local Area page. Málaga Airport is the fourth largest airport in Spain and has over 15 million passengers coming through the airport each year. The sun, the beaches, golf courses, and cultural monuments have made Málaga a favourite holiday destination in Spain and in Europe. One of the best ways to experience everything the country has to offer is to hire a car during your holiday in Malaga. What sets Helle Hollis apart from other Malaga car rental companies? Ensure your holiday starts with a smile by booking your car hire through Helle Hollis, we guarantee we’ll start your holiday with a smile! With a Helle Hollis rental car, there are absolutely no hidden extras with your booking, and in the rental rate, you will get a free extra driver, 24-hour road assistance and be part of our fair fuel policy. Our staff are very service minded and all staff are English speaking. Whatever time of the day or night you arrive or depart from Málaga Airport, we can serve you as we are open 24 hours a day, 7 days a week. We hired a car for 1 week in February this year. This was the first time we used Helle Hollis bit it won't be the last. The car did have a few dings prior to is picking it up, but they were happy take note of them prior to us leaving the building. A simple process for collecting and returning the car. The car itself worked well. Quiet and comfortable, even for 4 (larger sized) adults 😁. We shall be back. Car rental company’s in Spain can be a nightmare with added extras you don’t know about until your standing at the reception to pick your car up , but with Helle Hollis we’ve never had a problem and you know exactly what your cars going to cost you before you arrive at the office to collect your car and there’s never any hidden charges. We’ve used this company for many years now and will continue to do so when ever we need a hire car and we always get a discount for being a home owner in Spain which is an added bonus. Everything with Helle Hollis is straight forward, fast and kept simple . That's very good rental company. Small indeed but welcoming, quite cheap, no bad surpises. 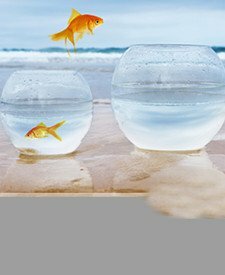 Just book you'll sea no credit card needed for this step. Appreciate the welcoming : human dimensioned. 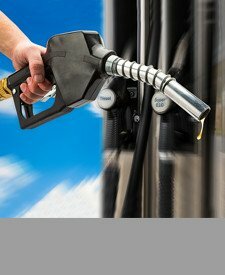 Our fair fuel policy means that you decide just how much fuel you want to return your car with. We always refund per full remaining quarter. Don’t worry if you have to catch a flight at 5 o’clock in the morning and are desperately looking for a petrol station next to Málaga Airport. We will refund you the unused fuel to the nearest quarter of the tank. If you are on a deadline to arrive at your accommodation or simply want to pick up your hire car from Malaga Airport as quickly as possible, then consider using our Fast Lane Service. We will prepare your rental car in advance and all you need to do upon arrival into Malaga Airport is to collect the keys. Remember to choose Fast Lane Service when you book your car hire online with Helle Hollis. Helle Hollis also offers Early Bird Discount on Malaga car rental when you book in advance. Book online and pay 30 days prior to your arrival to take advantage of free upgrade offers on the small car groups. And finally, we have a discount scheme for holiday home owners in Andalusia who can join the free Home Owners Club. Helle Hollis offers a wide range of car makes like Opel, Citroën, Toyota, Peugeot, BMW, VW, Hyundai, Kia, Nissan, Ford, and Fiat. We renew our fleet several times a year so we always have the latest cars to rent for your Malaga holiday. The fleet includes hybrid cars, automatics, minibuses for 7 or 9 people, convertibles, and of course compact and economic models. All Helle Hollis rental cars are smoke free to ensure your hire car is in perfect condition for use during your holiday. There are plenty of opportunities to compare different rates on Malaga car rental. Searching ‘car hire in Malaga’ on the internet will give you thousands of results from car hire companies and car hire brokers where you may find big price differences on the rental rate. Our advice is that if you see a very cheap rental rate, you should read the rental conditions extensively. Often a cheap car rental becomes much more expensive than expected as some car hire companies will add hidden extras onto your booking. In order to get the best prices on Malaga car hire, we would always recommend that you book in advance. 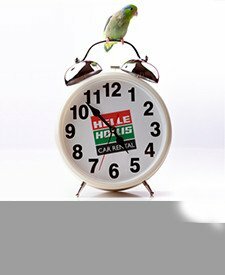 At Helle Hollis, we offer Early Bird discount or a free upgrade when you book 30 days in advance. Often the rental rate is also cheaper because there is more availability. The offers from Helle Hollis are applied automatically when you book online, making your booking completely hassle free. 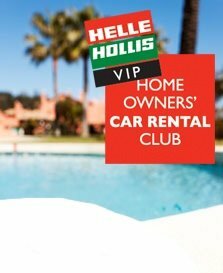 Furthermore, if you have a holiday home or are a resident in Spain, you are eligible to join the Helle Hollis Home Owners Club which gives you exclusive discount on the car rental rate and you will accumulate a bonus for the following year. The discount code can also be used by family and friends who are coming to visit your holiday home. Depending on whether you are coming from the west or east of Malaga, we recommend the following routes to return your hire car at Malaga airport. If you are coming from the Fuengirola side of Malaga, you will be driving on the AP-7 in the direction of Malaga. Turn off at the exit MA-21 Avda. Velázquez. After two kilometers drive, take Exit-2, N-348 Aeropuerto. At the roundabout follow signs for "Aeropuerto" and you will pass Helle Hollis on your right-hand and on the other hand the brewery San Miguel. To get to Helle Hollis, turn off at the next roundabout. If you wish to continue to Malaga airport you must continue straight ahead and turn right where it’s signposted to "Aeropuerto". You will then reach the departure hall of Malaga Airport. If you want to drive directly to the departure terminal at Malaga airport from AP-7, then you should stay on MA-20 until exit 3 signposted "Aeropuerto". If you are coming from Nerja on the AP-7, then take the exit MA-20 Torremolinos and then turn off at MA-21 exit 2. You will pass Helle Hollis Car Rental on your right-hand. Any discount voucher, promotion or charity code? I’m using my friend’s Home Owners’ Club number. Enter your promotion code to get your discounted rate. Enter your charity code to get your discount rate. Helle Hollis supports various charity organizations on the Costa del Sol e.g. Cudeca. If you have a discount voucher from a friend, then enter the discount number here.